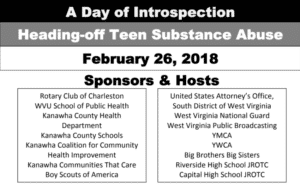 Numberous community partners are joining forces to bring “A Day of Introspection – Heading off Teen Substance Abuse” on February 26, 2018. The event brings “front and center” a topic of immense importance to all of us – especially in this region of the country where drug addiction, overdoses, and deaths are ravaging our communities. The February 26th “A Day of Introspection — Heading off Teen Substance Abuse” is designed to address #3 above. While #1 and #2 almost require people with special training or considerable commitment to get engaged and make a difference, #3 is something in which everybody and every organization can get involved immediately — and they should be involved. February 26th will hopefully jumpstart some initiatives to develop a long-term strategy across our Valley. Please put this date and times on your calendar. Try to attend any one of these three sessions and help make a difference. 8:30-10:30am Riverside High School Auditorium (Dr. Kristjansson, WVU School of Public Health; Bruce Griffin, National YMCA). Focus: Community organizations, eastern Kanawha County. 1:30-3:30pm Capital High School Auditorium (Dr. Kristjansson, WVU School of Public Health; Bruce Griffin, National YMCA). Focus: Community organizations, western Kanawha County.